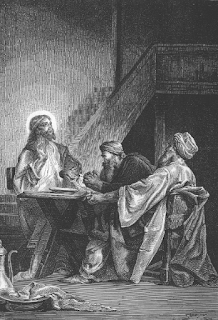 The story of the travelers meeting Jesus on the road to Emmaus is one of my favourites. Perhaps it's because I see myself in those sight-restrained disciples. I've often wondered, why did they not recognize Him? Then, after they had walked, talked, and listened to Jesus explain the Scriptures and convinced Him to eat with them, He went through those familiar motions: "… He took bread, blessed and broke it, and gave it to them…" Luke 24:30. They had seen this exact ritual before—at the feeding of the 5,000 (Matthew 14:19), the feeding of the 4,000 (Mark 8:6) and the last supper (Matthew 26:26). What a wonderful thing for which to be recognized! Jesus left after that. It seems His purpose was not to hang out with them in the way He had before. That time was over. Now they simply needed to know He was alive and how the events that had just taken place fulfilled prophecy. "Jesus joins us as we walk in sadness and explains the scriptures to us. But we do not know that it is Jesus. We think of him as a stranger who knows less than we do of what is happening in our lives. And still—we know something, we sense something, we intuit something: our hearts begin to burn. At the very moment that he is with us we can't fully understand what is happening. We can't speak about it to each other. Later, yes, later, when it is all over, we might be able to say, 'Did not our hearts burn within us as he talked to us on the road and explained the scriptures to us?' But when he walks with us it is all too close for reflection" - Henri Nouwen, With Burning Hearts, p. 50. PRAYER: Dear Jesus help me to recognize Your voice. Thank You for the witness of a burning heart. Please stir up the coals to a hotter fire. Amen. Jesus came to ignite inner fire - Luke 12:49. It is kindled by meditation, and bursts into speech - Psalm 39:3. It is fed by fellowship with Jesus - Luke 24:32. The light in our hearts is a reflection of "the glory of God in the face of Christ" - 2 Corinthians 4:6. That inner fire makes it impossible not to speak - Jeremiah 20:9. "So they rose up that very hour and returned to Jerusalem …. And they told about the things that had happened on the road, and how He was known to them in the breaking of bread" - Mark 24:33,35.